often because previous owners are no longer able to look after them. 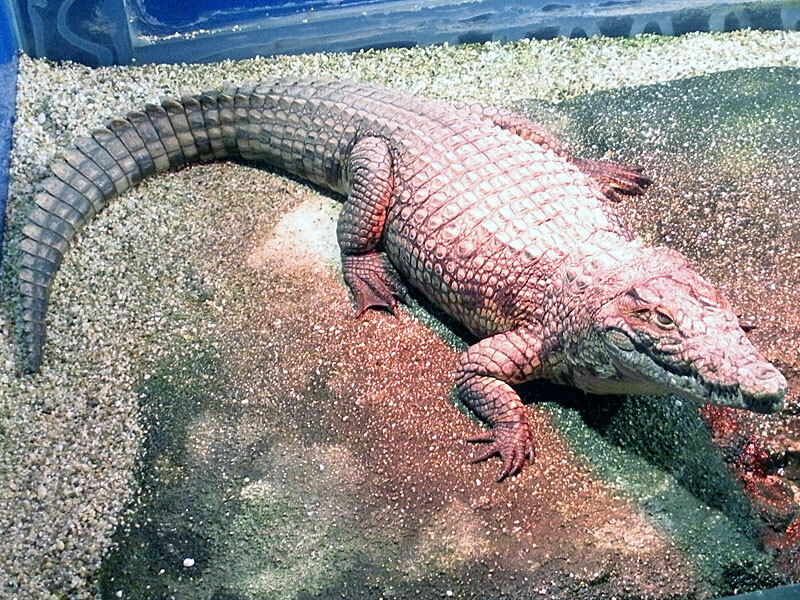 Sobek is yet another crocodilian from the pet trade. In this case, however, it was actually the pet shop itself which elected to hand him over to us in Hersonissos. He is named after the ancient Egyptian deity who, those making their living on the Nile believed, would protect them from crocodiles provided they showed proper respect! We weren't sure which page to put Pinky (in the background) and Perky on! Strictly speaking, they aren't reptiles - but amphibians which have taken a funny turn in their evolution.. 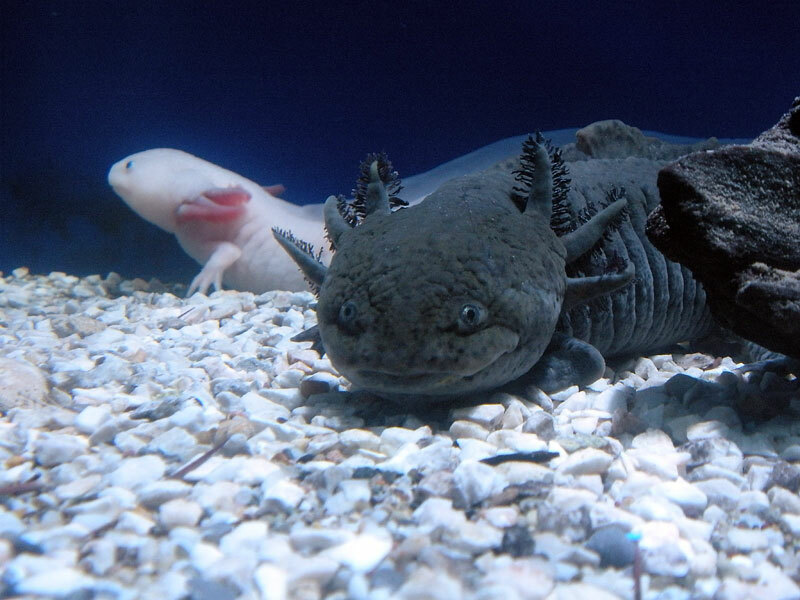 They should lose their gills and emerge onland as adult salamanders, but they've decided not to do that any more - perhaps because local Mexicans catch them and sell them as human food! 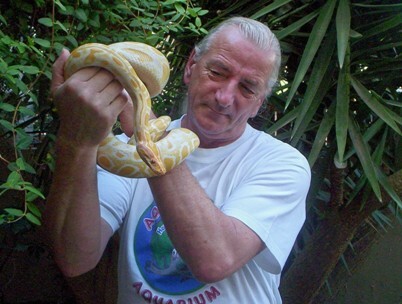 Raja is a beautiful albino Burmese python whose fabulous markings simply take your breath away. Although "albino" normally means an almost total lack of colour, his brilliant regal gold perfectly reflects the meaning of his name - King of the Snakes! Hatched in 2006, Raja is sure to enjoy a long and happy reign at Aquaworld. Mr Prickles rules - he's the boss! Regal king of the reptile garden, this green iguana doesn't understand any part of the word 'No' and tries to do just as he pleases. Having said that, he's not a wild type and allows himself to be petted for photographs. 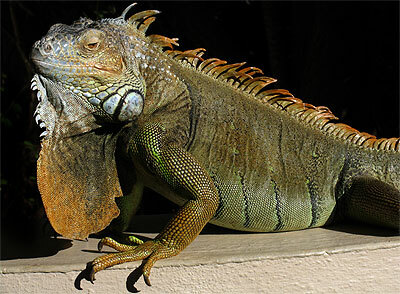 Green iguanas are amongst the largest lizards commonly kept as pets. 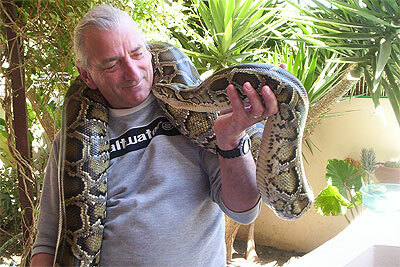 They can live for almost 30 years, reaching 2 metres in length and 12 kilos in weight - quite a handful! Mookie arrived at Aquaworld in the middle of 2008. 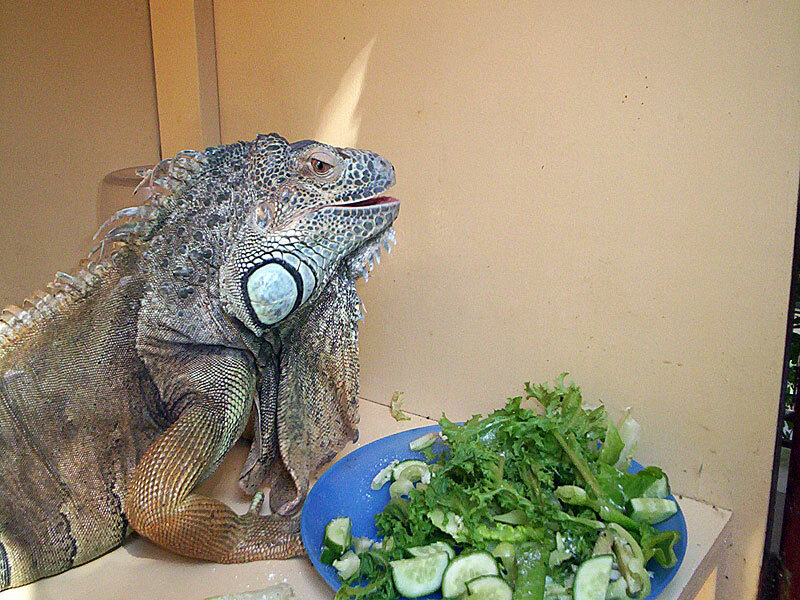 This iguana's previous loving owners could no longer provide the necessary care and, having assured us that Mookie was a female - and therefore no threat to Mr Prickles - we agreed to give "her" a place here in Hersonissos. Of course, one look at Mookie on arrival confirmed that "she" was a "he" and we now have to keep these two ultra-territorial guys apart! Spot the leopard gecko enjoys life at Aquaworld with his harem of female companions including Lump and Bump. So far, they have produced just one little one - but we are hoping for more soon! 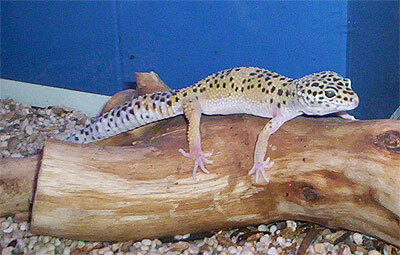 Leopard geckos originally come from India, Pakistan and Afghanistan, but they are now captive bred and are commonly available in pet shops. 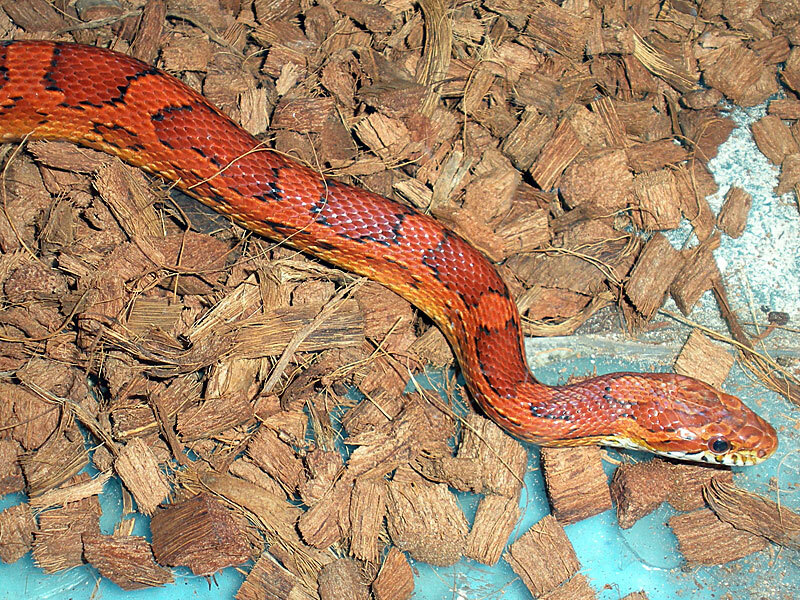 Shrek is a gorgeous red corn snake who has settled down very well here at Aquaworld. The climate in Hersonissos seems to suit him down to a tee and he has reached roughly half of his full size (150cm or so) in just one year! Corn snakes got their name either because their undersides resemble maize, or perhaps because early European settlers in the US often found them in or near corn fields. Whatever the case, these vigorous and undemanding snakes are often the beginner's choice when setting out on the rewarding hobby of keeping snakes. Humbug is, as his name implies, a beautiful black and white snake. 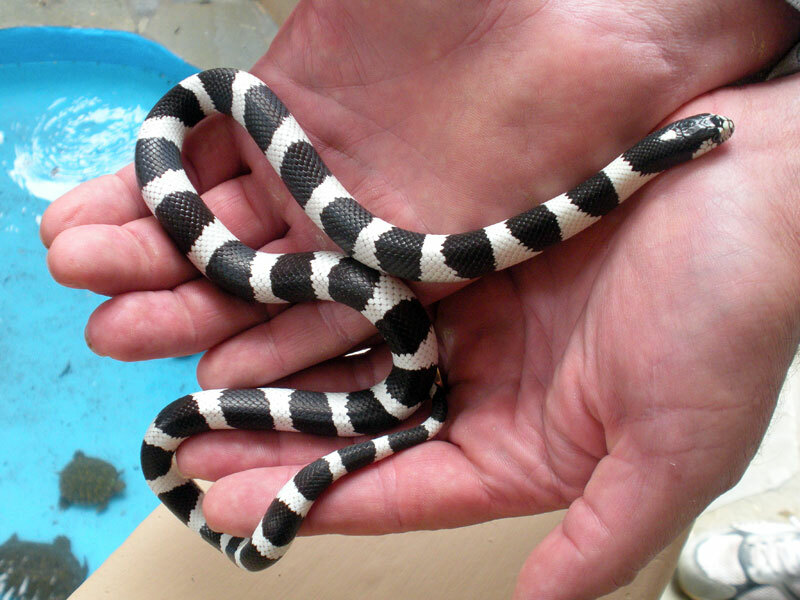 Like all Californian kingsnakes, he can reach 2m in overall length. As with all the snakes at Aquaworld, Humbug does not pose a danger to humans. Californians must really appreciate the kingsnakes, however, since they often kill and eat highly venomous rattlesnakes. They even have a natural anti-serum in their blood to protect them when fighting rattlers! Thrassivoulas is an occasional visitor to Aquaworld. When Michaelis, his student owner, is busy with his seasonal work - this friendly boa comes to stay with us and give everyone a loving squeeze! 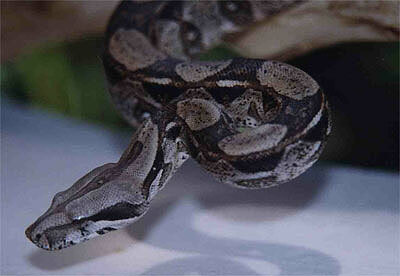 Boas originate in South America but, in spite of their reputation, do not reach a size comparable to the giant pythons. 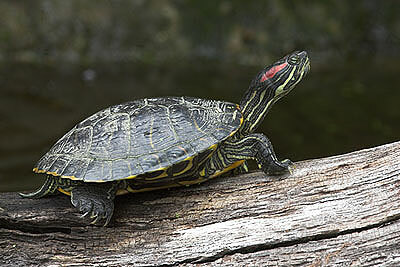 The red-eared terrapin is part of one of those sad stories where humans introduce non-native creatures which subsequently wreak havoc with truly endemic species. These terrapins have been released into the wild here in Crete and are serious competition for the Balkan terrapin locals. Here at Aquaworld we have a pool full of unwanted red-ears and take care of them rather than have them possibly wipe out their Balkan cousins. Blondie has been under our care for several years now, as is the case with Elle, until their owner can take care of them himself once more. They both seem to enjoy life at Aquaworld with the others of their family. African spurred tortoises can reach eighty kilos in weight and dig holes eight metres deep - so think twice if you feel like buying one for the back garden! Twitch is a great pal of both Dino and Mr Prickles. 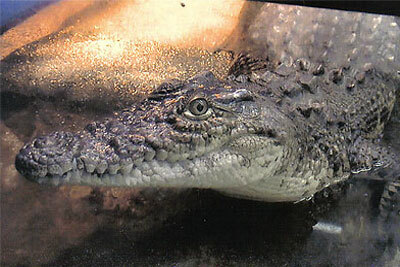 He has lived at Aquaworld since 2001 and probably originated from Cyprus. His favourite trick is 'playing dead' - lying unmoving on his back with all four legs sticking up in the air - obviously a defence mechanism agamas find useful! 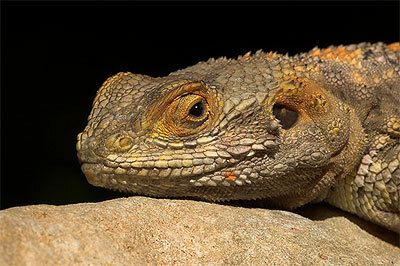 Starred agamas are found on several Greek islands as well as in North Africa. Totally against all internationally agreed treaties, Snap was for sale as a hatchling nile crocodile in the Greek pet trade in 2001. We bought him to remove him from a terrible situation and possibly a short, miserable life. Snap is doing very well and growing fast, but given the space limitations here at Aquaworld, we will need to find a new home for him soon. Snap now re-homed - click here to read about it! 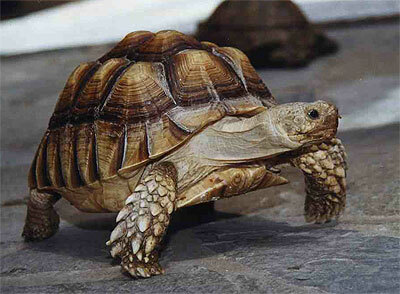 Burma arrived as a 60cm hatchling in 2001 but, as you can see, made remarkable progress from then on. Sadly, Burma died unexpectedly on September 4th, 2008 - exactly two years after the tragic death of Steve Irwin. She will long be remembered by all who visit Aquaworld and came to know her gentle, trusting nature.